Happy Thursday everybody! I am back again with a new tutorial for you, in honor of a special celebration; Altenew is celebrating their 4th Anniversary! There are lots of anniversary celebrations happening lately… it’s so exciting to see so many of our favorite companies celebrating such wonderful milestones! 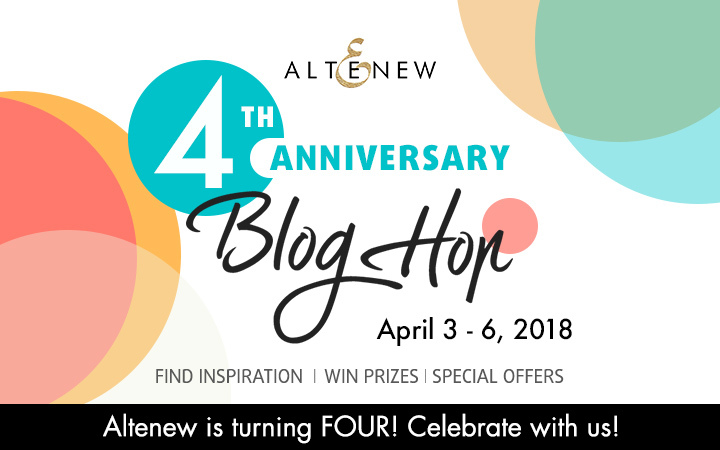 If you are just joining in the Altenew Anniversary blog hop, you should have arrived from the talented Laurel Beard’s blog! 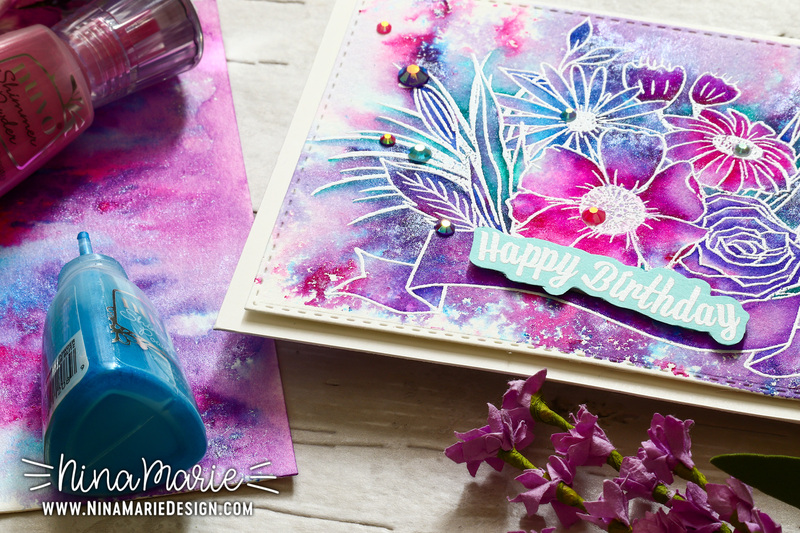 In my project for the anniversary blog hop, I am using the stunning Altenew Happy Bloom stamp set and Tonic Studios’ Shimmer Powders. 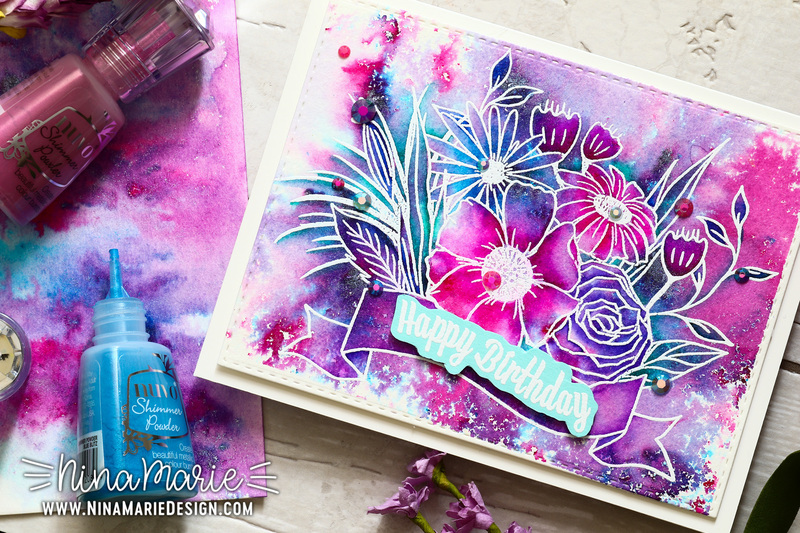 These gorgeous watercolor powders create mesmerizing effects; I used them to make a beautiful background that I used for a Zig Marker underpainting technique. Underpainting is something I’ve been really enjoying lately; you can see more underpainting projects I’ve made by clicking here. The vibrancy of these Shimmer Powders are incredible. Coupled with similar tones of Zig markers, the white heat embossed florals simply pop off this card. Plus, as the name suggests, these powders are extremely shimmery; when they capture the light, it is so pretty! I embellished the design with some of Pretty Pink Posh’s new jewels; Amethyst, Aquamarine and Watermelon. I also popped up a sentiment from Happy Bloom that I white heat embossed onto Mermaid cardstock. 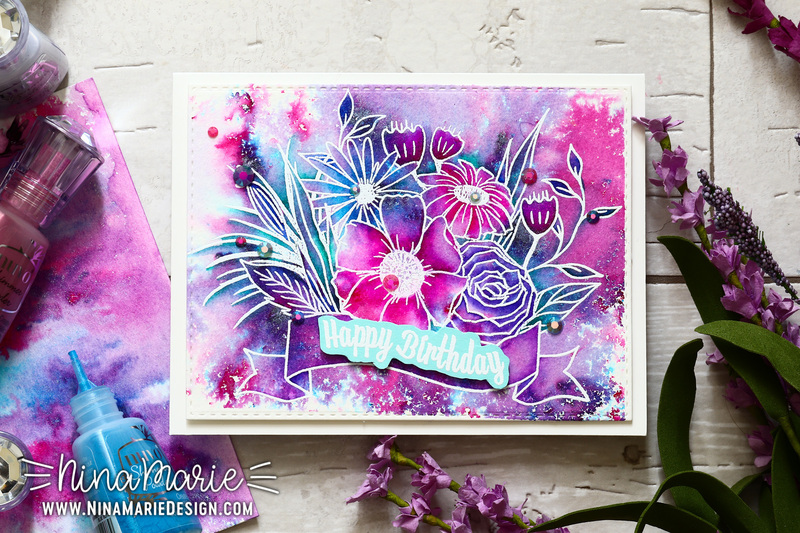 If you would like to see how I created this fun watercolor effect, be sure to press play on the video at the top of this post! And be sure to keep on reading for all the details on the Altenew Anniversary blog hop (plus giveaways!). Thanks for visiting with me today; I’ll be back soon with a brand new video for you! There are over 30 amazing prizes being given away in this hop, including 5 Altenew $50 gift certificates, an Altenew Academy class for 5 lucky winners and a Simon Says Stamp $50 gift certificate, just to name a few! 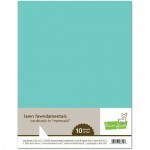 You can see all the prizes at the Altenew blog. Be sure to leave comments by April 15th, 2018 at 11:59 PM EDT for a chance to win! 30 WINNERS will be chosen at random from the comments left on any of the blogs in the hop. Winners will be announced on the Altenew blog on April 17th, 2018. I’m the last stop of the hop! If you missed any of the stops or want to start at the beginning, visit the Altenew blog! Stunning work with all these lovely colours. Absolutely gorgeous!!! Would love to be able to see the shimmer in real life! I bet it’s stunning! 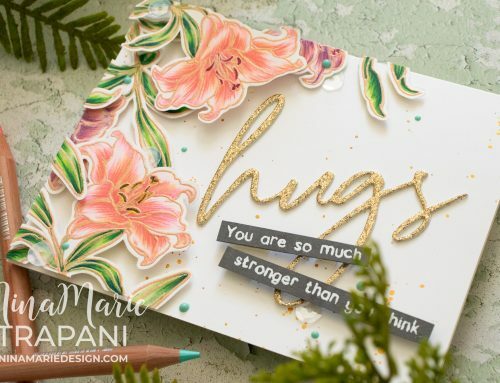 Adorable card and fabulous colors! Thanks for the inspiration. 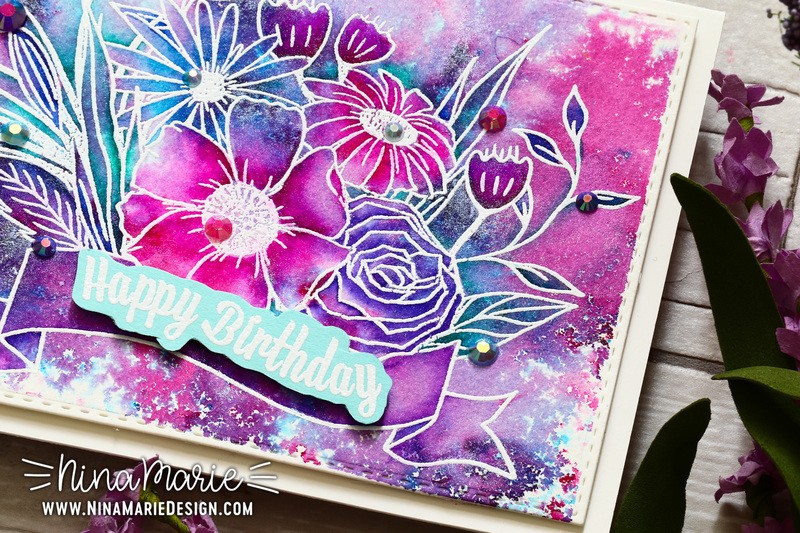 Your bold water colors really pop with the white embossed flowers. Very cool! Oh no, Nina! More sparkly watercolor products that I need! I love how this turned out; it looks like a floral galaxy. Despite the fact that my to-buy list just got that much longer, I appreciate you sharing. Both the cards are just spectacular. Your card is gorgeous, I just love it. Those colors are wild, so beautiful, really amazing. It’s a wow card. I am in love with flowers. We had a ton of flowers in our yard but we have some mutant ninja squirrels and now we don’t have any anymore.That’s why I love to stamp. I can have all the flowers I want and those mutant ninja squirrels can’t ruin them! LOL I love the embossing and the new jewels which I want to get when I win. Thank you for showing us your pretty, colorful card and for giving us the chance to win something. This is just beautiful! I’ve never heard of shimmer powder before!! Thank you! !